The Hurricane Mk I Late is a Rank I British fighter with a battle rating of 2.7 (AB), 2.3 (RB), and 2.0 (SB). It has been in the game since the start of the Open Beta Test prior to Update 1.29. The Hawker Hurricane is a monoplane developed in the late 1930s by Sydney Camm. This plane was based on the British reserve plane, the Hawker Fury. 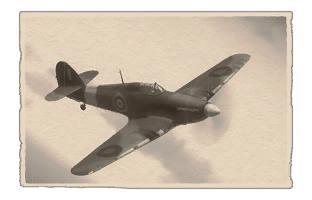 The Hurricane Mk I/L is one of the first monoplane fighters you will come across within the British tree. The aircraft is powered by a Rolls-Royce Merlin III and comes equipped with eight Browning 7.7 mm machine guns, with four situated in each wing. Whilst not quite as maneuverable or as fast as its Spitfire brethren, the Hurricane Mk I/L is still very agile for its rank and can hold its own very effectively in dogfights. One of the Hurricane’s true strengths is in its durability and sheer robust nature which makes it a favorite among the virtual pilots of War Thunder as it was during the Battle of Britain almost 75 years ago. You will find your Hurricane able to withstand a very high amount of damage before it will give in as it is a largely fabric covered aircraft. It is also a very stable gun platform which makes aiming and shooting a very easy task to do. In general the Hurricane is a joy to fly in all modes. A great and forgiving fighter aircraft for beginners to fly! The strong, sturdy wings on the Hurricane make for an excellent gun platform for pilots. So whilst it may lack the punch of cannons or heavier machine guns, you will find the Hurricane’s agility and ability to put accurate fire on targets to be in your favor. The standard “Hawker” style wide track landing gear present on most, if not all of their monoplane fighters is of course found on the Hurricane Mk I/L as well, making this aircraft much more appealing to newer players when landing due to its stability. In combat the Hurricane Mk I/L allows pilots to engage almost any aircraft comfortably. Many of the fighters you will face do not have the agility to outmaneuver the Hurricane, which will only be surpassed by any biplanes or Japanese fighters you may face. Lone Fighter-Bombers, Attackers, Heavy Fighters and Bombers should also present little threat to the Hurricane as its 8 machine guns provide a dense spread of fire at a fast rate, whilst the rigidity and durability of the airframe will cope with the return fire of the opposing aircrafts’ gunners. The Hurricane Mk.I has eight .303 calibre machine guns, four in each wing. However, unlike the Spitfire, the Hurricane's guns are all in a single group, so it provides a better firing platform than the spitfire by allowing it's firepower to be concentrated. For realistic battles and simulator battles the rate of fire and the subsequent lack of ammo are an important issue to keep in mind. It is easy to deplete the entire ammo with a long burst. Trigger discipline is the key here! Furthermore the Hurricane's heavy weight, due its old-fashioned tube chassis (unlike the more modern Spitfire with its nutshell chassis design), results in good vertical energy retention, allowing the plane to perform Boom & Zoom maneuvers with great success. Utilize them as the standard form of fighting in both modes, as unlike in Arcade, regaining energy and speed after a turn fight takes rather long, leaving you vulnerable to fighters who didn't join the conflict earlier. Countering the Hurricane almost completely depends on what kind of plane you are flying. If you see a Hurricane there are three things to remember: It is extremely good at turning, very durable and it has 8 machine guns, which despite their small caliber are extremely deadly. It will be able to place you in its cross hairs very quickly and saturate you with rounds. The Hurricane Mk I/L is not without its weaknesses however. It isn't particularly fast, doesn't dive very well and performs poorly at high altitude. It also doesn't have WEP, meaning that at 100% power the plane is giving its all. When countering the Hurricane, you must take these strengths and weaknesses into account and also your own. If your plane is faster than the Hurricane but does not turn as well, you should boom and zoom, diving on the Hurricane from altitude and strafing it as you speed by. In a successful attempt, you will destroy the Hurricane in one pass. However, if you miss or only cause minor damage you may need to make another pass. In no situation should you try to turn fight the Hurricane at this stage. You will bleed energy and it will easily out turn and destroy you. Instead you should use the speed gained in the dive to climb away, leaving the Hurricane behind. When you have achieved an appropriate altitude and speed you can then turn back and make another pass. This kind of maneuver takes patience, but is worth it when it comes to fighting the Hurricane. Impatience will only get you killed. If you want to have a higher success rate with boom and zoom tactics, it is good to choose a well-armed plane. Something with cannons or high caliber machine guns should suffice. Planes like the Bf 109, Mig 3, LaGG-3-8, P36 and even attackers like the IL2 are effective at boom and zoom tactics on the Hurricane. Some planes can also turn fight the Hurricane. Most biplanes should have equal or better turning capabilities than the Hurricane. An inexperienced/impatient Hurricane pilot may try to out turn a biplane, usually resulting in disaster. However, biplanes are slower. They will often find experienced Hurricane pilots performing tactics like the above mentioned boom and zoom where the Hurricane can use its higher speed to climb away after a pass. There are also some monoplanes that can out turn a Hurricane. The I-16 will definitely challenge the Hurricane and so will the Japanese Ki-27 Otsu and A5M4. However, similar to biplanes, they are slow and in the case of the Japanese very poorly armed. The Hurricane has a very agile, yet durable airframe. Whilst the iconic Supermarine Spitfire is commonly associated with the RAF’s role in the Battle of Britain, its stablemate and fellow frontline fighter at the time is often overlooked. The rugged and reliable Hawker Hurricane, first flown in November of 1935, claimed some 60% of the RAF’s aerial victories in the summer of 1940 above Britain against the Luftwaffe’s Bf 109 E, Bf 110, He-111, Ju-87, Ju-88 and Do-17 types to name a few. Sydney Camm who designed the Hurricane based it off the successes of the Hawker Fury biplane and when placed side by side, the family resemblance is clear to see. As the Hurricane was an evolution of the Fury, so too was its Rolls-Royce Merlin V-12 powerplant, derived from the Fury’s Rolls-Royce Kestrel engine. Entering service in December 1937 with No. 111 Squadron the Hurricane soon spread to many frontline squadrons across the RAF’s theatres of operation. Many of the RAF’s leading pilots and squadrons in the Battle of Britain owe their success to the Hurricane Mk I, such as the Czechoslovakian No.310 Squadron based initially at RAF Duxford in 1940 or the famous Polish No.303 Squadron who ended the battle with 126 destroyed, 13 probable and 9 damaged during the Battle of Britain. This page was last edited on 16 April 2019, at 07:22.